Please contact us if our frequently asked questions below do not answer your query. Yes. You will only be prescribed medication once you have received an online consultation with a qualified doctor and your medication will be dispensed from a registered pharmacy. Websites offering direct prescription medications are illegal and should be avoided. How do I obtain my treatment? The process is very simple and is described in full in the section headed How We Work. Other websites allow me to purchase my medication immediately, why is your process more complicated? Our process is actually pretty simple and we give helpful prompts at every stage. The reason that we ask you to undergo a medical consultation first is that we are required to do this by the regulatory authorities in the UK. It is illegal to name and price prescription medications prior to a medical consultation. You would be well advised to avoid any site offering direct prescriptions as they are acting illegally and they could be putting you and others at risk. How do I know that your doctors and pharmacists are genuine? We disclose the name of the doctor who signs any prescription issued to you. You can check the doctor's registration at the General Medical Council website. 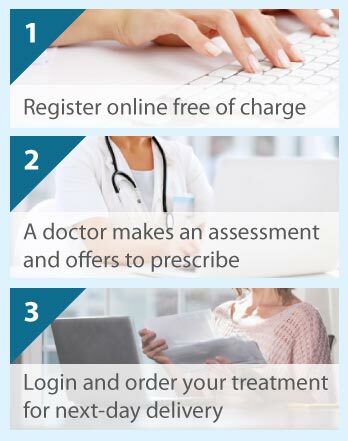 If you go to the Who We Are page of this website, there are instructions on how to check our pharmacy's registration details through the Royal Pharmaceutical Society of Great Britain. Do I need to consult with my own doctor? For the vast majority of cases the online consultation process is sufficient to make an accurate diagnosis. However, it is always advisable to consult your own doctor before commencing any course of medication. The Online Clinic will notify your own doctor of any medication prescribed if you make this request at the time of your order. How do I know that any medication dispensed is genuine? All medication is dispensed from a UK registered pharmacy which is monitored by the MHRA. Particulars of the registered pharmacy which dispenses your medication are included in the package carrying your medication. You can check the registration details of our pharmacy from the Who We Are page. No. There are no hidden costs. The prices that we advertise are the prices that you will be charged. We do not charge for the consultation and the cost of delivery is included in the advertised price of the medication. The Online Clinic is committed to patient privacy and security. All information that you supply to us is protected under doctor/patient privilege. Our online ordering system uses secure encryption technology. All credit card information is submitted with the highest level of security for your protection. Will the package in which the medication arrives refer to The Online Clinic? No. All packaging is extremely discreet. There will be no mention of The Online Clinic on the outside and it will be impossible to discern the contents of the package. Do I need to be at home to sign for the package? Yes. Royal Mail will require a signature on delivery as confirmation of receipt. If you are not at home when Royal Mail attempts to make a delivery, you can pick up your package from your local post office at a time convenient to you. Royal Mail will advise you of which local post office holds your package. Alternatively, you could arrange for your package to be delivered to another address, e.g. your work address. Which debit and credit cards do you accept? We accept Visa, MasterCard, American Express, Visa Electron , Visa Delta, Switch/Maestro and Solo. How will the transaction appear on my card statement? The transaction will appear as Online Clinic (UK). Can I pay with cheque or postal order? We are happy to accept cheques and postal orders. For obvious reasons, we cannot dispatch the medication until the cheque has cleared. Cheques are submitted for express clearance to minimise the delay in the dispatch of your medication. The doctor may need to contact you with regard to your consultation. Your landline telephone number will not be used for any marketing purpose whatsoever. If you provide your mobile telephone number, you will receive SMS notifications relating to your consultation. From time to time, we will send SMS notifications of promotional offers you are eligible for. You can opt out of receiving these offers through your secure user area. Alternatively, you can opt out by replying STOP to the SMS notification. Please contact us if you require any further assistance. If I register with you will I start receiving unsolicited mail? No. We strongly object to spam and assure you that your details will not be used for any such purpose. What if my questions have not been answered in any of the above? Please feel free to contact us by writing, e-mailing or calling us. All our details are included on the contact page. We will attempt to answer your query as promptly as possible.